How to Create a Reflow Profile for a 16-layer, 2mm Thickness PCB with a High Density SMT Connector? 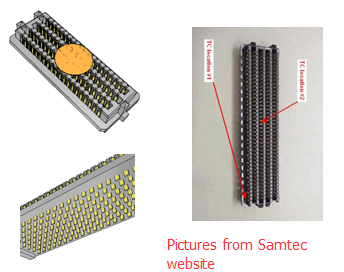 A high density SMT connector, such as the Samtec .050" SEARAY™ High Speed High Density Open Pin Field Array, has up to 500 I/O contact pins with a solder charge termination. This type of connector looks like a standard BGA type of SMT device. A proper thermal profile for reflow must be evaluated by the process engineer prior to production. To verify the correct reflow profile, 2~3 thermocouples should be placed beneath the connector: one (1) in the leading corner position, one (1) in the middle of the connector, and one (1) at the trailing corner (optional). These theremocouple placements ensure that all areas of the connector receive even heating sumultaneously. To ensure proper temperature equalization of the whole area beneath the connector, it is recommended that the soak time is long enough as well as the time above liquidus be long enough for a total reflow. Of course, all data must meet with the solder paste manufacturer’s specifications. A PCB’s physical properties are also another critical consideration for correct profile adjustment. In this case, the PCB has 16 layers and a 2mm thickness. This mean that this bare board has a high thermal resistance. So, the preheat set point can be adjusted higher than normal; however, the cooling point may lower than normal in order to meet TAL within the specifications. Previous：How to create a Centroid File from Eagle, Altium and ORCAD/ALLEGRO?